Composer Jonathan Hering and film-maker Jack Whiteley team up to stunning effect for a unique Bluecoat-commissioned piece for DaDaFest, Getintothis’ Benjamin Duvall nets a three-pointer. Jonathan Hering and Jack Whiteley‘s Rhapsody for Clarinet and Wheelchair Basketball Team presents a thoroughly engaging combination between sound and image with all the nuanced rhythms, emotional dynamics and deceptively clever pacing of a well played game. Minimally staged in the Bluecoat‘s performance space as film projection with accompanying clarinet soloist (Mandy Burvill), the piece foregrounds the kinetic, visceral action of the sport rather than taking a ‘game as narrative’ approach with the familiar push and pull of win or lose. Shot from a multitude of angles that create a memorable series of tableaux from the peaks and lulls of the game – the wheelchairs being unpacked in readiness, an injured player’s twitching hand – and bathed in a cool blue tint, Whiteley’s visual flair gives a terrific impact to the carefully sampled sounds of the basketball court. The looped bass-boom reverberations of the bouncing ball mark time whilst filling the full expanse of the screen, whilst in a quieter moment the mechanical whirr of rotating wheels is intimately exaggerated in extreme close-up. The highly effective use of captured rhythmic sounds – from the violence of crashing chairs to the low-level ambient noise of the court – brings to mind Kraftwerk‘s playful sampling of bike chains and gears on 1981’s Tour De France, with the quickening pulse of the basketball itself providing a suitably dramatic bridge into the different sections. 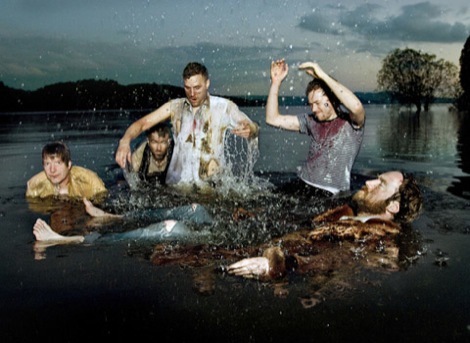 The use of upended spinning wheels during the pieces’ quieter section is reminiscent of the more reflective moments of Aphex Twin‘s Come to Daddy and makes the frantic finale of shouts, bounces and clatter all the more effective. Hering’s score for clarinet achieves a delicate balance between driving the impressionistic narrative forward and offering a lyrical response to the action onscreen. Energetic with more than a hint of mischievousness, the most effective moments come when soloist Burvill engages in a melodic call and response with the players’ onscreen shouts, creating a musical mimic of their verbal interjections, quickly building into a pacey syncopated melody. A world away from the square jawed determination of Vangelis‘ Chariots of Fire or the syrupy symphonics of Michael Torke‘s “Sonic Olympiad” Javelin, the ambiguous emotional tone of the scoring sits suitably alongside the array of images, creating a wonderful series of dramatic moments without resorting to cliché. Given the focus on a Paralympic sport and the piece’s inclusion in DaDaFest, it would have been easy for Hering and Whiteley to focus on more mawkish sentiments; instead they create a character of the entire team rather than any one individual, as well as delivering a highly enjoyable aural and visual portrait of the sport itself. 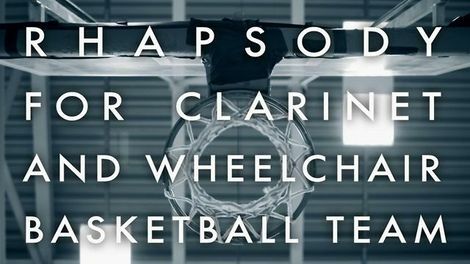 Rhapsody for Clarinet and Wheelchair Basketball Team from Jack Whiteley on Vimeo.